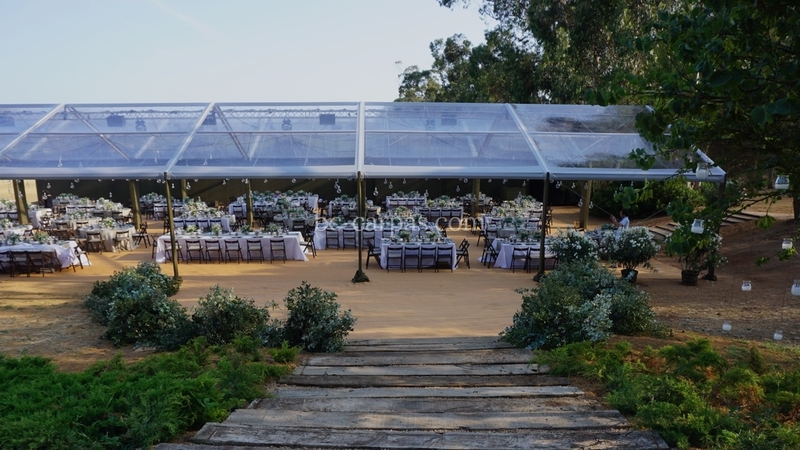 The client has a family country home, but it annot accommodate a wedding with 400 guests. This is why they came to BC Carpas for advice on everything concerning a wedding, where, in addition to a cocktail reception, banquet and dancing, there had to be kitchens and bathrooms for guests. 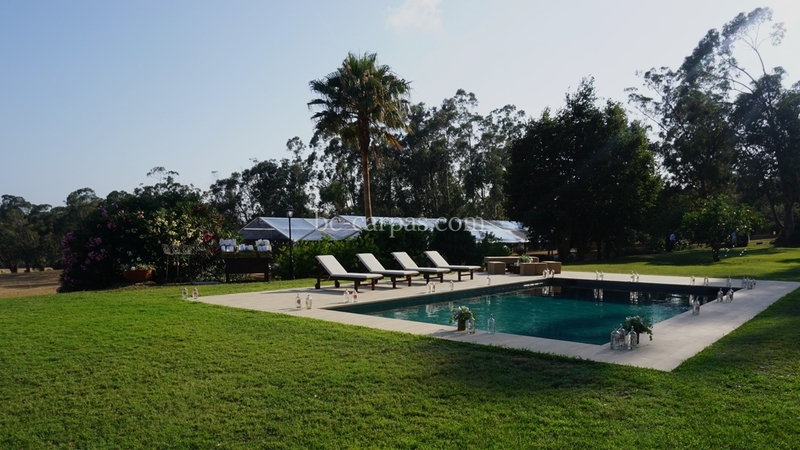 At BC Carpas we are used to managing comprehensive projects. However, we need to remember that, in addition to everything required for the wedding to logistically work, the bride needs to feel that her wedding is going to be the most special we have ever held, which is why our team has to think of something completely different and original. 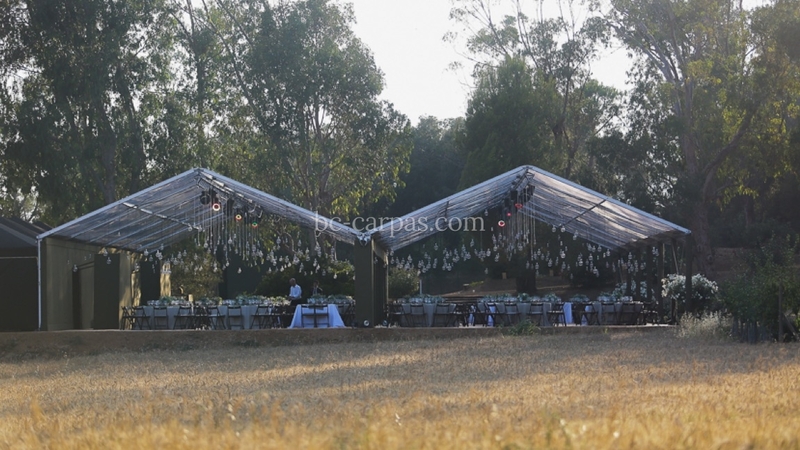 For this country wedding, the clients put all their trust in BC Carpas and it was a successful wedding. 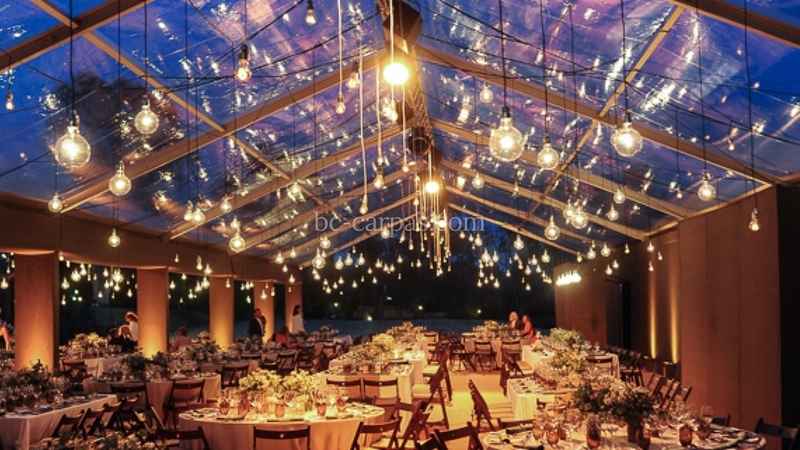 The banquet space was magical, decorated with countless warm fairy lights hung at different heights, creating an enviable space. 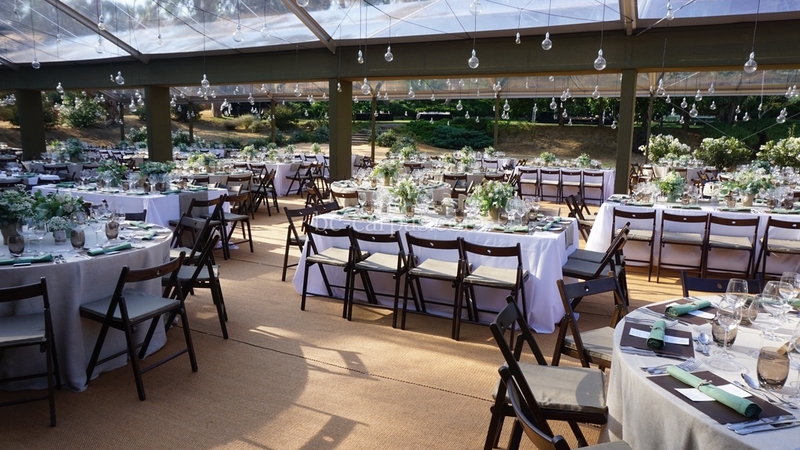 The good weather also meant that all the marquee curtains could be removed, so that the space was open with no division between the inside and outside of the transparent marquee. Tthe entire structure was upholstered in brown. For the disco, a huge 4 metre high truss full of coloured lights was installed, in addition to a large disco ball in the middle. 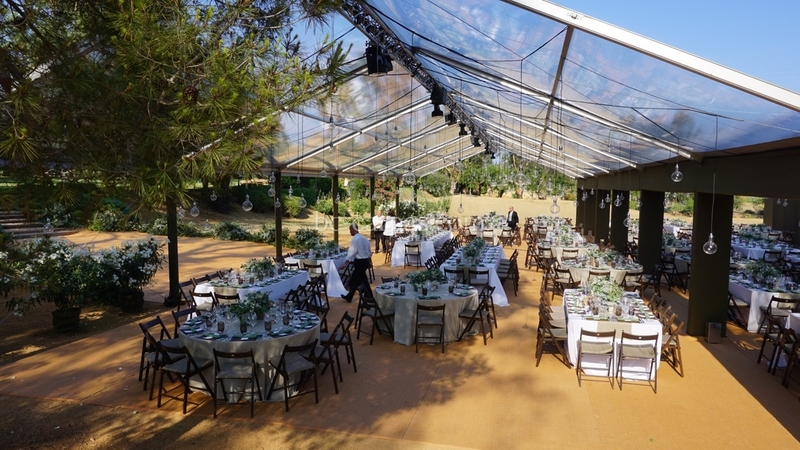 The dance was held a few metres from the transparent banquet marquee and a wooden pallet was installed on the lawn to level out the ground. The lighting tests that were done the day before the wedding. 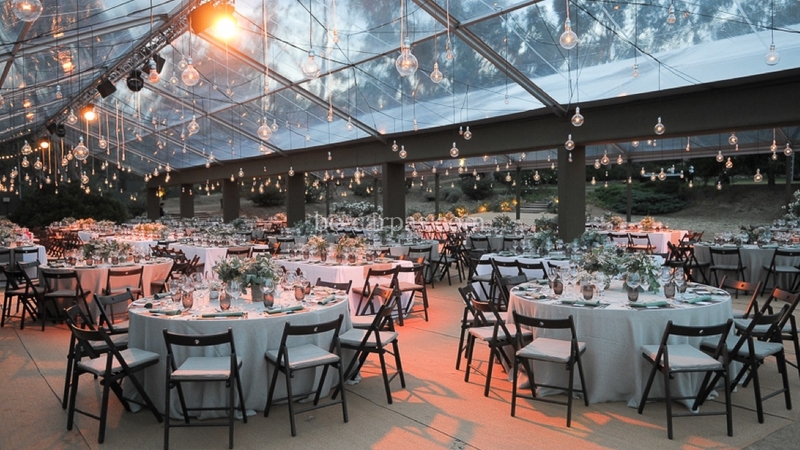 In the image the transparent marquee can be fully seen with no enclosure or curtain. 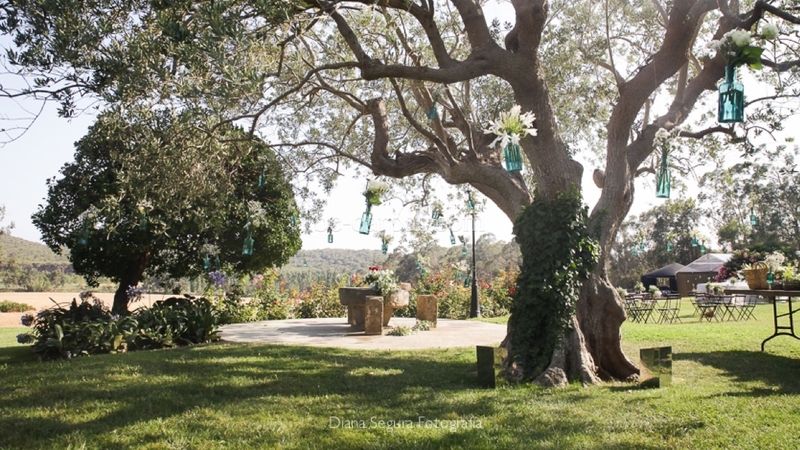 Wedding decoration on tree branches using glass bottles and flowers. Half-way through the afternoon, everything is now ready for the wedding guests to dine in this sublime marquee. 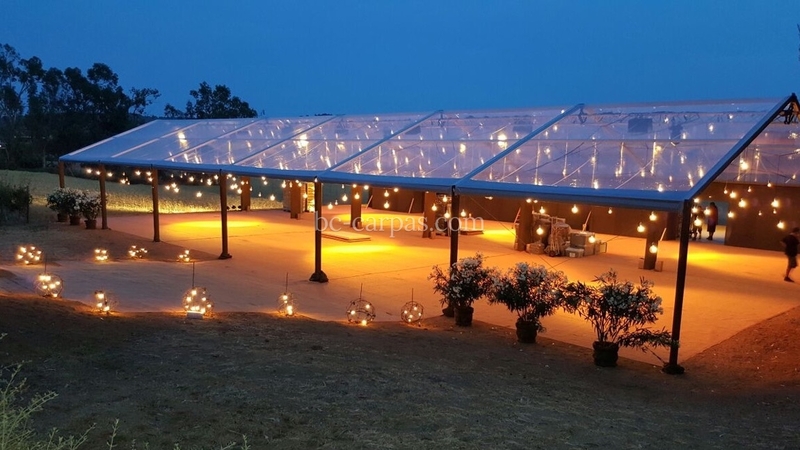 Image of the preparations that are going to be done in the wedding marquee. 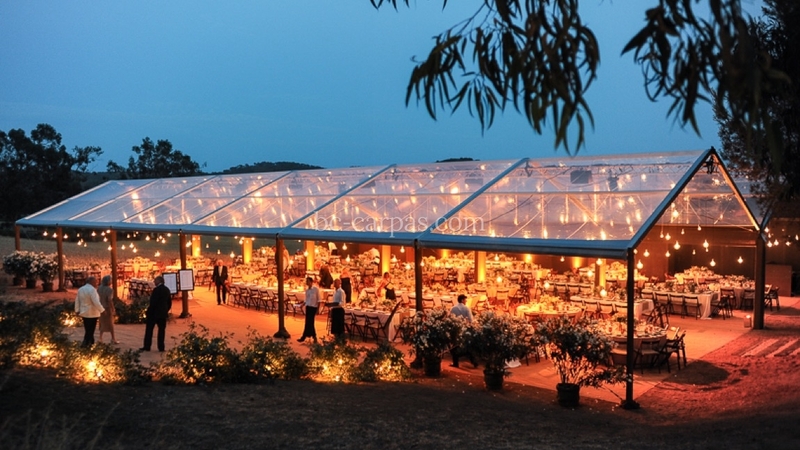 At night, the lit up marquee can be seen and all the waiters ready for the arrival of the wedding guests. Photo of the inside of the marquee, where you can see all the tables ready, overhead lighting and light vertically illuminating each column. 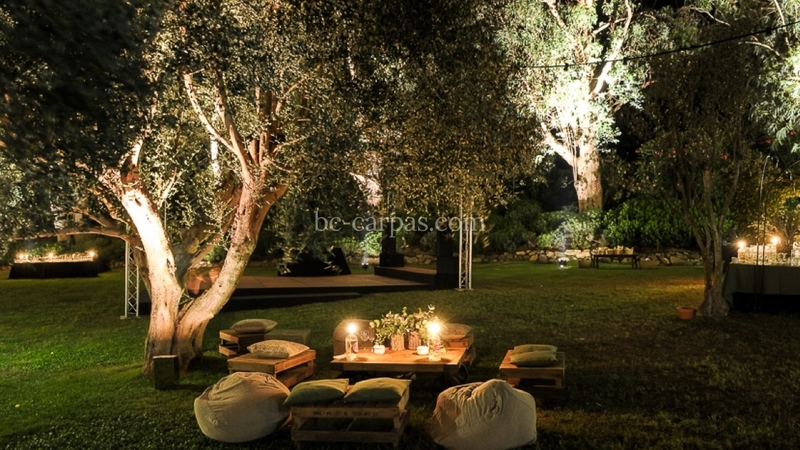 Photo of the garden lit up with a chill-our zone under a tree. The wedding dance floor is in the background. Inside the transparent marquee where the floor matt can be perfectly seen. 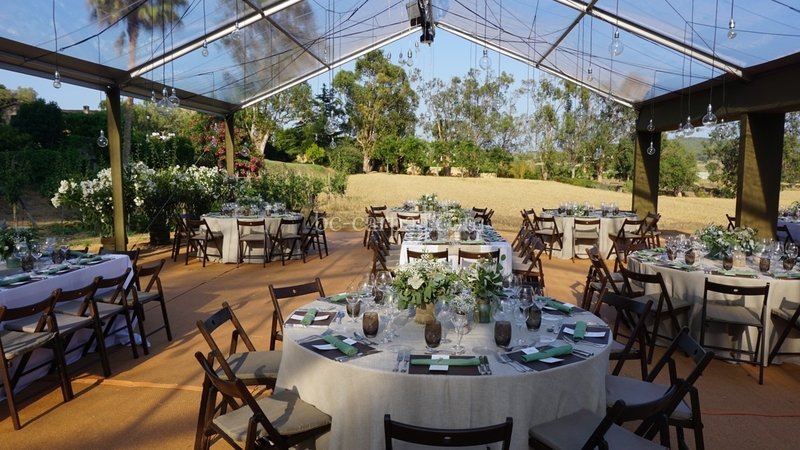 The tables are round and rectangular with wooden folding chairs. 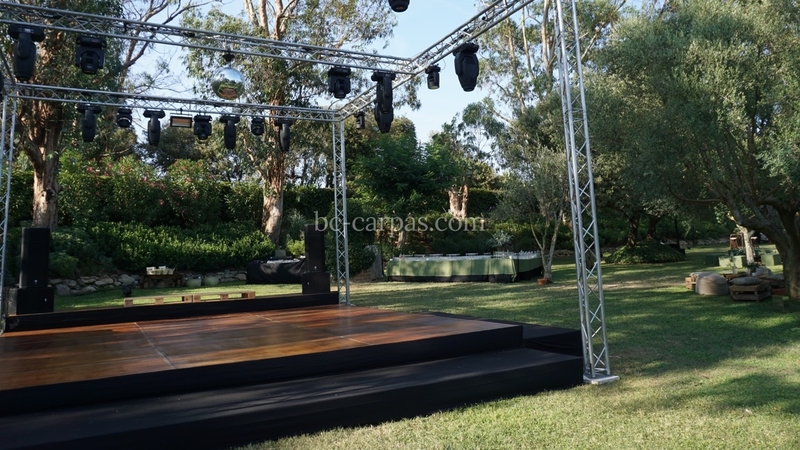 Wooden pallet surrounded by a truss structure where the disco lights are attached. 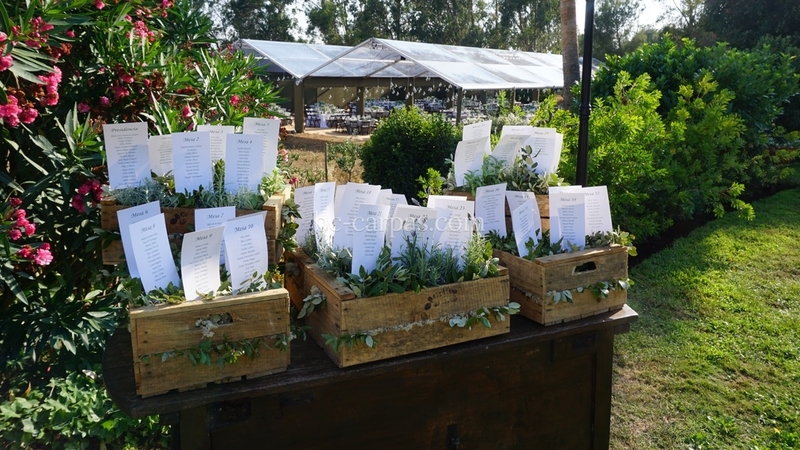 The table place names in wooden boxes with plants; really ingenious and decorative. View of the wedding marquee from the swimming pool, small decorative details are placed around the pool. View of the marquee entrance with the wooden staircare going down towards the marquee. Photo of the wedding from the centre of the marquee, where the weddings guests' spectacular view can be seen. 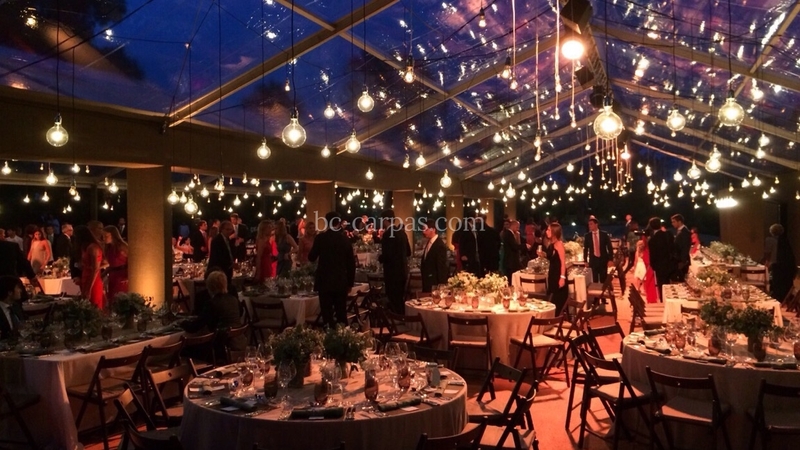 Already at the party, an image of all the guests enjoying this magical wedding can be seen.